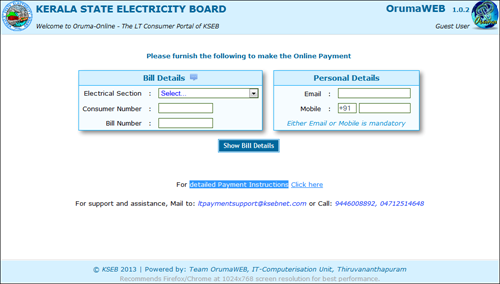 Kerala State Electricity Board (KSEB) bill payment is now online at KSEB website www.kseb.in. After successfully enabling online electricity bill payment facility in Thiruvanathapuram, the Kerala State Electricity Board (KSEB) is extending the facility to the 85 lakhs consumers' across the state. The payment can be made through net banking or debit/credit cards. After successfully enabling online electricity bill payment facility in Thiruvanathapuram, the Kerala State Electricity Board (KSEB) is extending their facility to the 85 lakhs consumers' across the state. So as the process goes live, the long queues in front of electricity offices for paying electricity bills might become a fairy tale to be shared with the next generation. Having 85 lakh-strong domestic consumers extended up in 729 electrical sections in the state, this facility would add more comfort while paying the bill. The payment can be made through net banking or debt/credit cards on KSEB website www.kseb.in. As you enter the site, it would lead to a link where one has to give the details about like, electrical section code, consumer number; bill number and either e-mail id or mobile number and later make the payment. A transaction charge will be deducted from the bank account of the consumer. ORUMA, the KSEB software has been used to bring out the best through the facility. Currently KSEB is running the trials to ensure the work goes perfect. If things go fine, the facility would be enabled within two weeks. As KWA and BSNL have already started the online payment method, KSEB too hope to get good response from consumers. Through this facility, consumers can make the payment at their comfort at any place or at their own time. Before making the payment, it would be better to read the detailed payment instructions. Balance amount along with the Surcharge applicable will be displayed. While for Net Banking, the transaction charge will be shown in the payment gateway site. Once the payment is completed do take out the printout with the details of the transaction. The details will be sent to the given Email/Mobile also. If the consumer has any objection regarding the bill amount shown in this portal and the original bill kept in the Section Office, the original bill will be taken into consideration.